332 pages | 42 B/W Illus. This casebook is a collection of international teaching cases focusing on contemporary human resource management issues. Each case centers primarily on one country and illustrates a significant challenge faced by managers and HR practitioners, helping students to understand how the issues they learn about in class play out in the real world. The cases emphasize the national and cultural contexts of HR management, providing readers with a global understanding of employee motivation, reward systems, recruitment and selection, career development, and more. In this edition, the editors and authors have made significant updates to reflect recent developments in the field and cover a broader range of countries in Eastern Europe and Africa. The authors also delve into new industries like food service, clothing manufacturing, and transportation as well as IT and academia. Recommendations for further reading and relevant videos provide readers with practical insights into the modern HRM field. With more than 30 cases followed by questions and tasks to encourage reflection, this is a valuable companion for any student of human resource management. 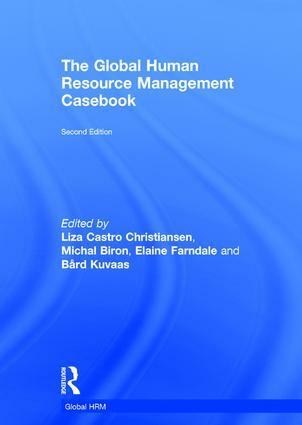 "The Global Human Resource Management Casebook is an excellent source of real-life case studies from organizations around the world, which will undoubtedly help students, scholars, and practitioners alike to better understand regional and national intricacies of managing human resources in the global context. Both the scope and the breadth of cases included, as well as their outstanding contributors, will ensure continued success of the book." "The casebook's first edition has been an invaluable resource for teaching and learning and this second edition is even more impressive. The wide-ranging global perspectives present real insight into the HR challenges organizations face around the world and emphasize unique context-driven issues in particular countries as well as more universal concerns that matter regardless of location. A notable array of international scholars, case questions, and teaching notes makes this an indispensable resource on global HR management." Liza Castro Christiansen isan Associate Professor at Business Academy Aarhus, University of Applied Sciences, Denmark, and a Visiting Academic Fellow of the Doctoral Program at Henley Business School, UK. Michal Biron is a Senior Lecturer and Head of the MBA Program and the MBA Program for Not-for-Profit Organizations at the University of Haifa, Israel, and an affiliate of the HR Studies Department at Tilburg University, the Netherlands. Elaine Farndale is an Associate Professor of Human Resource Management at The Pennsylvania State University, USA, and is affiliated with the HR Studies Department at Tilburg University, the Netherlands. Bård Kuvaas is a Professor of Organizational Psychology and Associate Dean of the Doctoral Program at BI Norwegian School of Management, Norway. Edited and authored by the best and most well known researchers in the field of human resource management (HRM), this series of books offers students accessible, coordinated and comprehensive textbooks on global HRM. To be used individually or together, these books cover the main bases of the area, including titles on global alliances, corporations, leadership, legal systems, staffing and compensation systems. The series is organized into three strands: the first reflects general issues of global HRM; the second more specific HR functions in a global context; and the third, comparative human resource management. Taking an expert look at an increasingly important area of global business, this is a groundbreaking new series that answers a real need for serious textbooks on global HRM. Dedication: The late Professor Michael Poole was one of the founding series editors, and Profesors Schuler, Jackson, and Sparrow wish to dedicate the series to his memory.